Valuable lighting tips for your residential, commercial, indoor or outdoor spaces. Why is My Light Bulb Burning Out? If you’ve ever experienced the saga of a light fixture that repeatedly burns through bulbs, you know how frustrating it is. The good news is that there is often a very simple solution. Bulbs that are subject to lots of vibration are prone to early failure. This is commonly seen in ceiling fans, garage door lights, or underneath a particularly active room like a child’s playroom. Solution: Look for bulbs labeled “rough service” that are designed with thicker filaments to handle more vibration. Another option is to switch to LED light bulbs, which aren’t affected by vibration since they do not house filaments. Like most things in life, you get what you pay for. That pack of 10 bulbs at the dollar store may seem like a great bargain, but be ready to change them often. 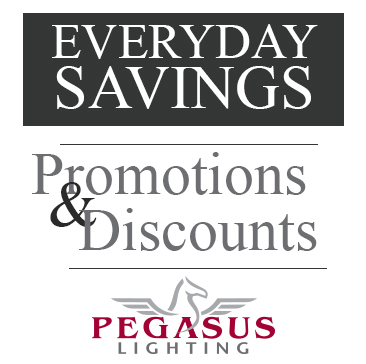 Solution: Shop for quality bulbs from trusted companies (ahem, Pegasus Lighting). If your bulb gets too hot, it can greatly reduce its lifespan. Several things can make a bulb burn too hot: Voltage fluctuations, wattage limitations, or being in an enclosed fixture can cause overheating. Certain types of halogen bulbs will overheat when handled with bare hands because the oils from your fingers create hot spots on the bulb. Last week I tackled the question of whether or not yellow bug lights actually work to reduce the swarms of insects you usually see around a light. If you haven’t read it yet, here’s the cliff notes: Yes, they do. But you’re going to need more in your arsenal. Unleash your inner Clint Eastwood with this salt-laden bug obliterator. The Bug-a-Salt fires a lethal grade of table salt to destroy its winged victims. Are you attracting customers to your trade show exhibit with a killer lighting strategy? There are plenty of ways to discourage people from approaching your trade show booth (overwhelming salespeople… underwhelming salespeople…annoying gimmicks) but how do you encourage people to come look at the product or company that you’ve worked so hard to build? When it’s you against hundreds of other companies that are all vying for attention, an eye-catching, interest-generating trade show booth has to have the right lighting strategy to draw a crowd. Know your venue lighting situation in advance. Having a head start on the lighting guidelines of your trade show venue is as important as knowing who your competition will be. Some convention centers have very strict regulations that will hamper even the most brilliant exhibit. The last thing you want to find out is that your track lights exceed height requirements or the wattage of your bulbs violate fire safety regulations, leaving your well-thought-out booth design fading into the background. Contact your venue ahead of time so that there aren’t any last-minute surprises. Once you’ve got the logistics nailed down, you can start diving into the details of your lighting strategy. Knowing the lighting situation before arriving at your trade show is crucial. It seems odd to be “springing” forward when I’m still sloshing through the mud left behind by record winter snowstorms. This Sunday clocks adjust forward one hour for Daylight Saving Time, leaving many Monday morning commuters groggy, sleep-deprived and searching for the nearest java joint. If you’re usually one of those dazed drivers, there are some simple strategies that you can start implementing today that will leave you refreshed and alert when you hit the streets next week. In the Carolinas, snow days are a rare treat, but their scarcity means we aren’t always ready for what comes along with them. Hazardous driving conditions, icy steps, power outages and stir-crazy kids are par for the course. With a little planning, some creativity and a few affordable products, many winter weather woes can be alleviated.